Mornington Peninsula Brewery is one of Australia's foremost brewers. This is the first in their range of one-off cans in the #tinnage series, all of which we've been promised will have equally quirky artwork. It's a shame there's only 300 cases of this can, I'm sure there are heaps of can collectors out there who would love it! I was slightly surprised that no one had come up with the name Sacchariferous Stout for a Milk Stout(sometimes also called a Sweet Stout). For those of you who are unaware, Sacchariferous means containing sugar. Great pun names for beers are a dime a dozen, what matters are if Mornington are able to make a beer that stakes up to the name. The beer pours a very dark brown colour with an almost khaki coloured head. The head is close to three fingers high with some large bubbles in it. It's got pretty good retention with around a finger of head still remaining after 5 or so minutes, and a layer of foam covering the beer throughout drinking. It's a very enticing looking stout. Mornington's Sacchariferous Stout is everything you would hope of a beer with this name; it's both sweet and dark. The coffee is definitely more muted when it comes to the taste, but it is there - particularly as the beer warms. The chocolate is much more pronounced as is a milky sweetness, it's almost like drinking dairy milk chocolate at points. Yet it's not sweet enough to put me off, it's just a brilliantly drinkable beer. I've said it before, and I'm sure I'll say it again; everything Mornington touches seems to turn to gold. 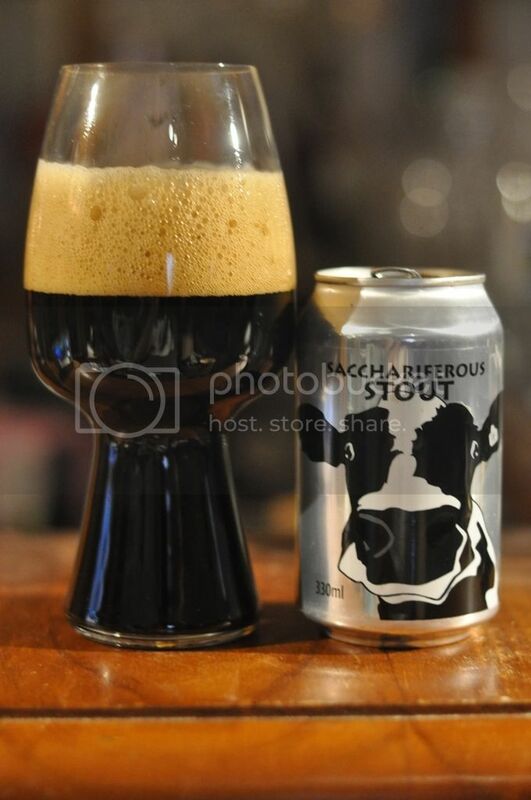 Sacchariferous Stout is no exception, it's a fantastic example of a Milk Stout and I have absolutely no doubt that this beer will be repeated, despite what Mornington have said... I really hope I'm right and they back flip on this being a one off - it's a wonderful example of a style we see very little of.